2017 sees Milton Keynes, the UK's fastest growing place, celebrate its 50th birthday. The Official 2017 Milton Keynes City Atlas at 1:10,000 scale shows community facilities, important buildings, schools, places of interest, the 350 kilometres of redway and leisure route networks and land use categories including residential, employment, educational and health areas as well as district centres and open and recreational spaces. Accompanied by comprehensive street, local area name and roundabout indexes. There is a map showing the city and its surrounding area at 1:190,000 scale, including urban areas, unitary authority and county boundaries, roads, railways, rivers, woods and a national cycle routes. The principal roads and local areas names are shown on a double page spread. Central Milton Keynes also has its own extra large plan at 1:4,600 scale. There are also town plans for Newport Pagnell, Olney and Woburn Sands at 1:15,000 scale with associated street indexes. The atlas comes with a free pullout District Leisure Guide that gives details and locations for all the main cultural, leisure and sporting attractions in and around Milton Keynes. The locations of the all the entries are shown on an enlarged version of the Milton Keynes and surrounding area map from the atlas at 1:100,000 scale. 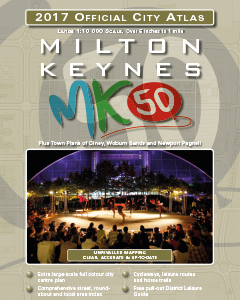 The Milton Keynes Atlas is available to buy online or by telephone from our business partner, Guidepost. Click on the logo below to visit their store.